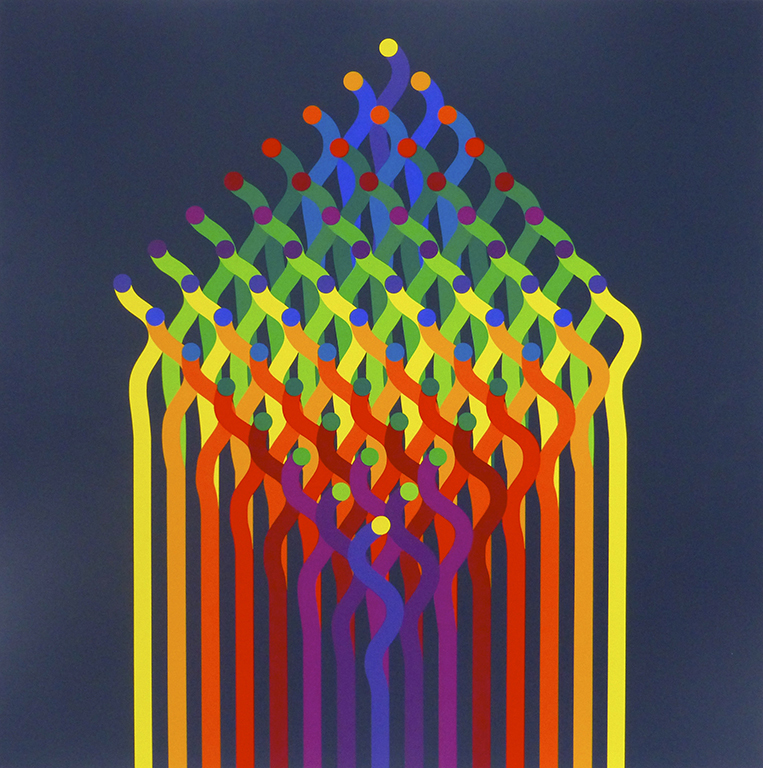 Julio Le Parc was born on September 23rd 1928 in the city of Mendoza, to a working-class family. At thirteen, he and his mother came to Buenos Aires, and he prepared to enter the Escuela de Bellas Artes while also working in a handbag factory to contribute to the family budget. He left art school in 1947, disappointed with the education that he received there and studied Concrete art and the spatialism of Lucio Fontana. Around 1954, he approached an experimental theatre group and entered the Escuela Superior de Bellas Artes where he participated in the student movements. There, he met Martha, who was to become his wife. In 1958, he was awarded a scholarship by the French Cultural Service and the travelled to Paris. There, he met art dealer Denise RenE and artists such as Vasarely, Vantongerloo and François Morellet. Later, together with Francisco Sobrino, he experimented with visual instability regarding sequences and progressions and with the possibilities of light images. In 1960, he founded the GRAV (Groupe de Recherche d’Art Visuel) together with Hugo Demarco, F. Garcia Miranda, Horacio Garcia Rossi, F. Molnar, F. Morellet, S. Moyano, Servanes, F. Sobrino, J. Stein and Yvaral. The group held its first exhibition at Le Parc’s studio. It comprised small light boxes with movement as well as wooden reliefs with which he investigated the effects of indirect and low light. The GRAV got in touch with the “N” group of Padua, the “T” group of Milan and other artists in 1962. The international Nouvelle Tendence movement was created. In 1964, he obtained the Special Prize (acquisition) in the Premio Internacional Torcuato Di Tella. At that time, the GRAV made several Labyrinths and, on April 19th 1966, they carried out Une journee dans la rue, an experiment with audience-participation organised in different locations through out the city of Paris. That year, he obtained the International Painting Grand Prix at the XXXIII Venice Biennial. In 1967, he held his first retrospective exhibition at the Instituto Di Tella in Buenos Aires. He continued to experiment with pulsating light, distorted forms and transparent walls. The following year, as a member of the GRAV, he presented A la busqueda de un nuevo espectador (In search of a new spectator) in Dortmund, Germany. He also he participated in the elaboration of numerous texts: Proposiciones sobre el movimiento (Proposals on movement), Basta de mitificaciones (No more mythologizing) and Proposicion para un lugar de activacion (Proposal for a place of activation) among others. During the events of May ‘68, he was expelled from France. He travelled around various European countries only to return five months later when the restriction was revoked. The GRAV was dissolved, explicitly recognizing as one of the reasons, the contradiction between the ideal of anonymity that had been proposed and the circumstance of each of the members. He participated in Unofficial Latin America, held in Paris, and the Medellin Biennial in Colombia in 1970. He held numerous retrospective exhibitions in major museums in Havana, Düsseldorf, Montevideo, Caracas, Asuncion, Mexico City, Stockholm, Berlin, Madrid, Barcelona, Santiago de Chile and Porto Alegre. 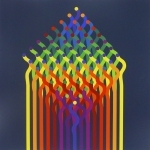 From the mid-seventies, he developed his works on Modulaciones (Modulations) in shades of grey and incorporating colour. Later he worked on the series Alquimias (Alchemies). The BBC of London devoted a documentary film to him in 1978. Between 1999 and 2000, he presented an important retrospective exhibition that travelled throughout Buenos Aires, Mendoza and Cordoba. He lives in Paris with his family.